Security and surveillance are always an area where homeowners or business establishment organizations can not compromise. People are always looking for a compact and multiple featured security camera systems where they can easily monitor the developments in their absence. 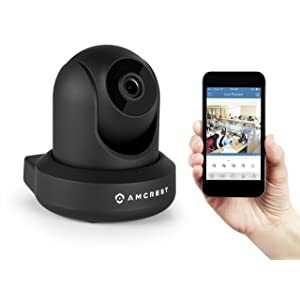 Amcrest ProHD 1080P WiFi Wireless IP Security Camera featuring with all the modern facilities, including the best remote connectivity and let you keep in touch with your home or office anytime, anywhere. 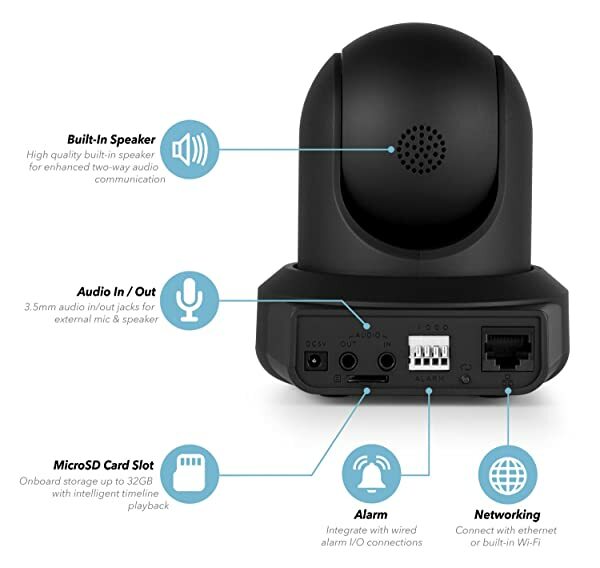 The Amcrest ProHD is an advanced feature packed home surveillance camera with a two-way communication system, Pan & Tilt, IR night vision features, motion alerts, digital zoom, Macro SD card slot and many other smart features, makes this one of the best nanny cameras that being sold in the market. The two-way communication system is one of the friendliest features you can find in this security camera. It will let you talk with your toddler, can see your baby and even watch how the nanny is feeding the baby, etc…, all in your physical absence and you can stay connected with your family. IR night vision: Amcrest ProHD has equipped with 32ft night vision feature is made possible with12 IR LEDs. Its sensors are very robust to catch any moving objects within the perimeter of the camera lens. The night vision power is better than any other current camera system available in the market. Pan & Tilt: The tilt and Pan feature provided on this product take you to a new realm of surveillance possibility by remote monitoring using your mobile or laptop. Its 360-degree manoeuvring ability, with high-resolution picture qualities, let you watch everything happens within the perimeter of the camera. The camera offers 90-degree angles of surveillance coverage. Fix it quickly: The Amcrest ProHD comes with a bundle of quick installation features. The provide QR code; let you scan by your cell phone, especially if you are using iOS/Android featured cell phones. The app, Amcrest View Lite helps you to configure without using the router and complete the setup process. Once the connection setup process is over the system will immediately start beaming, securely encrypted audio-video visual to your personal gadgets, cell phone or tablet or computer. Free cloud saving: With the support of Amcrest Cloud, you can store 4 hours continuous recording without any extra cost. You can also have paid storage facilities with extra space with various storage day plans. The image quality will be assured to have 1080p. HD quality images: For better quality images it is fitted with Sony Image Sensor and it can offer 1080p high-quality, crisp pictures with a resolution of 1920×1080. With uncompromised quality, the camera can capture 30 frames per second. Wide Angle Lens for excellent coverage. Set up process would be painful for at least some people. Finally, pan, tilt and zoom feature options are not on live feed page. Therefore, when opting for PTZ, there is no way to get audio and mic or any other options. The product enjoys fantastic customer reviews on Amazon and many leading online stores. On Amazon, it has 4.2 stars ranking out of 5 stars and 64 percentages of customers have lavishly favoured the camera with full 5 stars ranking, followed by 16 percentages awarded 4stars ranking. Overall it is an acceptable level of classification. The Amcrest ProHD is a cool product. It can ease up your surveillance issues; since the technical options allow you to view your home or office remotely while you away, record, playback, communicate and even pan and tilt the camera the way how you want to have it. With full cloud support features, you will have free access to the stored images anytime, anywhere. Similarly, the night vision features, alert features, 24 hours accessibility, etc., are designed to meet your objectives that are essential for a surveillance camera system. The most disturbing factor of any security camera system is its accessibility, image quality, playback system, two-way communication, remote viewing, remote manoeuvring, cloud support and above all pricing factors. All these elements are cleverly managed in Amcrest ProHD 1080P WiFi Wireless IP Security Camera. In fact, this will free you from the mental stress, especially if you had a toddler at home and looked after by the nanny. Anytime, you can stay connected with your family or office makes things easy for you. With great quality HD crisp pictures, the camera can meet your expectations and offer value for money. I love the amcrest security system. setup is easy. camera quality is amazing ( truly 1080p resolution). the amcrest customer service was truly helpful. I definitely would recommend it out of the lot. Great security cam. I love its wireless nature and quality resolution. The video quality during day and night time can only be described as excellent. The Motion capture works amazing and I get to see whenever guests pull in or random cars use my driveway to turn around. I am not sure how I ended up here but I am glad I did! I was researching cameras for a friend and you my friend have sold me on the Amcrest ProHD security camera! I have a busy house with 5 kids, 4 cats, and 2 dogs. My wife is always saying she needs another pair of eyes so I think this will help her out a lot. I like that they can be used at night as well. My husband wanted to get a camera or two when we brought home our first born. This was 5 years ago. We have been through so many cameras, you would not believe! Someone he works with gave him his spare Amcrest Pro HD to try and we fell in love. We have 5 on the way and plan on getting more. We want to have our whole house safe and secure! !